Winter Offers from the Stackpole Inn. The clocks have gone back and there are only a few weeks left before Christmas. All the more reason to start enjoying some seasonal fare, getting out and about is fun even during the shorter days when venues light the log burners and get snug inside whatever is going on outside. 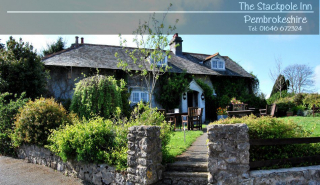 The Stackpole Inn is a warm and welcoming traditional Inn that is a must for local people and visitors. Especially with special offers available designed to make the Winter and Christmas very cosy and tasty. From November to the end of February 2017. Two courses for £10 pp, Monday to Thursday, Lunch and Dinner, choosing from their selected menu, two courses including starters and main courses, or deserts. Two Nights for the Price of One, in their bed and breakfast accommodation, anytime throughout the winter, this is a splendid offer for visitors who enjoy walking and touring the glorious Pembrokeshire Country side out of season. Guests wishing to take advantage of this offer should quote STACK 1617 when booking. Fish and chip Fridays, this has been running since September and is a firm favourite, serving a selection of fine fresh fish, in a choice of different batters, with real chips and peas, for the discerning there is even tartare sauce, and all for £10 pp. Fun Quiz nights, great fun with topical questions, brain teasing general knowledge, and great inter-team rivalry, on every other Tuesday. If in doubt ring in advance to check. Christmas at The Stackpole Inn, throughout December they are offering a choice of festive fare, three courses, with Christmas crackers, mince pies, and coffee all for £18 pp. Christmas Day at The Stackpole, their specially selected gourmet Christmas menu will take all the stress out of Christmas Day celebrations with a sumptuous meal, bubbly and canapes on arrival for £55 pp. A fine meal delightfully prepared, and no washing up after! The Stackpole Inn is a fine building in its own grounds, has a comfortable rustic feel to its spacious and well-appointed interior. Comfortable and inviting is the instant appeal for any diner. With its excellent restaurant, very comfortable hotel accommodation and well stocked bar The Stackpole Inn promises warm winter dining and Christmas festivities to warm the cockles, even if we do have a White Christmas. The Stackpole Inn is warmly recommended by the Best of Pembrokeshire, showcasing the finest local businesses in support of the Community.